Hela has a home! 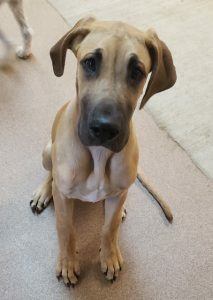 - Rocky Mountain Great Dane Rescue, Inc.
Hela has a home with her new family in Meridian, ID! Karece, Damon, and their daughter Anna, opened up their home to foster sweet Hela, and she stole their hearts immediately! Hela will share her home with Thor, a 2 year old Dane/Golden mix, Mitch, a 6 year old Aussie/Beagle mix, and Kip, a 3 year old house cat. She will enjoy lots of outings with her family as they plan to bring Hela everywhere they go! She will also enjoy family trips to OR, and running on the beach with her fur brothers. We are so happy for this sweet puppy and her new family! Way to go Hela!